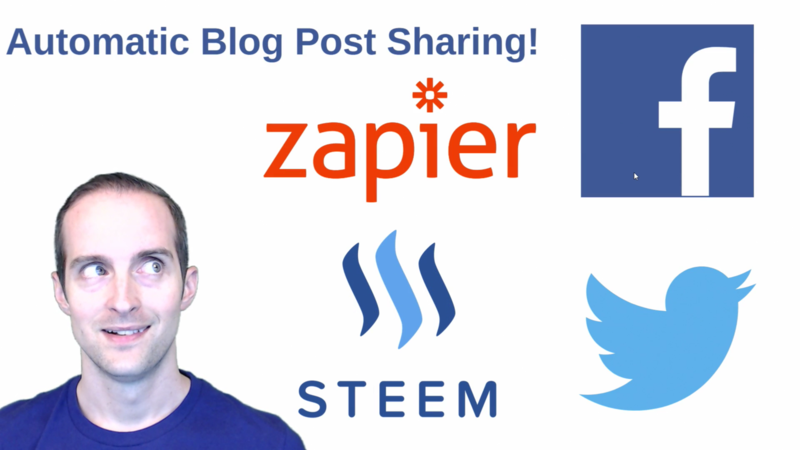 Publish Steemit Blog Posts Automatically to Facebook and Twitter with Zapier or IFTTT and Streemian! How much time will we save by setting up automatic sharing of our steemit.com posts on social media? Assuming it takes most of us an average of an extra one minute to share on both Facebook and Twitter after we post to our Steemit blog and that we make on average one post per day, setting up automatic posting will save 6 HOURS a year! While that might sound good, what makes automatic sharing great is the fact that if you are like me the truth is we might be too lazy to even take the extra one minute to share most of our Steemit posts anywhere else. I only shared one out of three of my first three posts to Facebook and Twitter which is why I NEED automation to help me make sure it always happens. Why bother taking the extra time to setup automation? Who cares if every post goes out to Facebook or Twitter? In about six years of digital marketing with mostly poor results the first three years which nearly put me out of business, the main mistake I kept making was inconsistency. For a month or so, I would post daily on my Facebook page and then for the next two months I might not even make one post after being disappointed with the results or receiving one negative comment. Meanwhile, the people that actually were enjoying reading my updates but never said anything (about 95% of users), stopped seeing my posts and forgot about me. When I would make a new post three months later, they often had moved on. For best results on social media, I have found almost nothing beats posting every single day because "what have you done for me lately" is primary for most of us. At the same time, the world tends to tell us to "DO MORE DO MORE TO BE ENOUGH" while most of us already have TOO MUCH to do! While it is tempting to just take the extra one minute to share on social media after posting on Steemit instead of spending thirty minutes to an hour to get the automation setup, how many times do we skip doing that one minute because we are in such a hurry? For me it is about 50% of the time which is why I depend on automation to help me then focus my consistency on a very small amount of tasks such as filming videos and writing posts here. Is setting automation up still worth it with 1, 10, 100, or 1,000 followers online? Absolutely because every single follower is valuable especially on Steemit! You might not believe which friends read your posts without liking them for months on social media and then finally convert to Steemit where they then will start upvoting your posts and hoping for you to do the same! I posted links to my stand up comedy on Facebook which almost no one liked or commented on a few months ago. Weeks later, one of my wife's friends told her she had watched it and it was too dirty for her. If she had not said that, I would have never imagined she would have actually seen the post on Facebook because it looked like the post had hardly went out to anyone in the newsfeed. Finally, wouldn't we each like all of our friends and family to be here to upvote our posts? Selling a signup here is not easy because the interface is a bit confusing at first and most of us honestly are not looking to start something new when we already are over our heads in what we are supposed to do. How much easier would it be to ask your family and friends to sign up here after they had seen 300 Steemit posts from you on Facebook and Twitter? Without those 300 posts delivered through automation, it is likely to be challenging. Taking the extra time to setup automation is most of our best chance at building our following on Steemit which is why I took the extra time to explain WHY do to it before I show you HOW. I highly recommend setting up both Facebook and Twitter if you have them because of the 711 words you just read or skimmed through quickly! How to setup automatic posting on Facebook, Twitter, and other social media platforms using streemian.com and Zapier or IFTTT which stands for If This Then That? The video and text guide below the video here will show you the easy steps which took me less than 30 minutes to figure out for both Facebook and Twitter. A HUGE THANK YOU to @ash for posting "How-To: Auto post your Steem Posts to Twitter/FB/EVERYTHING" at https://steemit.com/steemit/@ash/how-to-auto-post-your-steem-posts-to-twitter-fb-everything. @ash's post helped me discover https://streemian.com/rss/@jerrybanfield which was the one part of the system I did not know how to do before trying to setup my own automation! Find your RSS feed by switching your name out for mine! Thank you very much to Streemian for making this service freely available for all Steemit users! You now have a choice! Would you prefer a video tutorial going through each step of this in real time or to continue below the video for text and pictures of what I show in the video? Research Zapier or IFTTT to decide which you want to use to do your automation. This guide uses Zapier which is what I use and is available free for up to 100 tasks per month. You use a task each time you share one post to one social media account which means you can make up to 50 posts per month which will be automatically shared to Facebook and Twitter free. @ash uses IFTTT which I think you can also use free to do this. Would you please correct me in the comments if I am wrong? Find the make a Zap button and title your zap something like "Steemit.com post to Facebook" or whatever social media profile you are setting up! In your new zap, find the RSS feed option and add that as the first step. 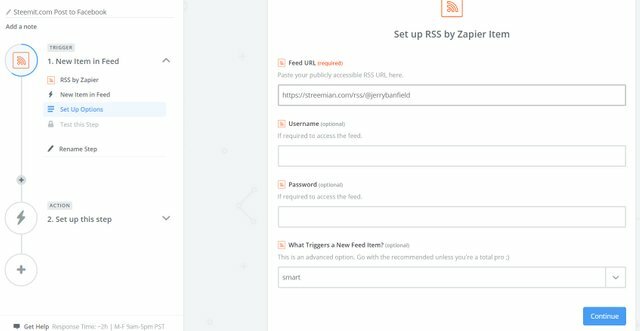 Select "New Item in Feed" to trigger the zap and then paste your feed from https://streemian.com/rss/@jerrybanfield into the feed URL with the username updated to what you want to use while leaving the remaining fields blank. Click through fetch and continue and verify you have the right feed by looking at the last post to see if it matches what you wanted. Hit continue and choose the social media type you want to use. I will show Facebook and Twitter here to make this guide the best. Facebook can be done with groups, profiles, and pages so make sure to choose which one you want. If you setup multiple zaps, it will cost you an extra action for every post toward your limit of 100 a month free meaning you really only want to choose two if you make one post a day total. For this example, I am doing my personal Facebook profile and selecting post to timeline. Connect your Facebook profile and you are ready for the next step. If there is a tricky part, this is it! Use the exact same fields I show in the screenshot to put the message and the URL in correctly which will allow Facebook to automatically pull the image and description. Specifically, use the title in the message field and the link in the link URL field with everything else blank. Complete the test and then verify your post came out correctly as mine did on both my Facebook page and Facebook group. If the test does not work, would you post in the comments because it will help us help you which will make this a better post for everyone reading it? This is how it should look when finished! MAKE SURE TO TURN ON THE ZAP after you are finished or it will not run for future posts! If you search for RSS and Twitter in Zapier, you will find a direct integration named "Tweet new blog posts" which will walk you through almost the same steps as above with Facebook. The first three steps are exactly the same which brings us to step 7 with Twitter and using this method even makes the walkthrough easier by not showing as many fields. Connect your Twitter account and choose to make a tweet as seen below but not on TV. Pick your Twitter account and then use the options it gives you. If it does not fill it in automatically, use a tweet with the title and link as we did in Facebook. Complete the test and verify your post came out correctly! If it does not, will you please ask for help in the comments below because it will make this a better post for everyone and maybe we will be able to help? Here is the post from my timeline. MAKE SURE TO TURN ON THE ZAP after you are finished or it will not run for future posts! If you would like to do more than 100 automated shares per month, you will need to upgrade to a paid plan which I think it worth it because of the time saved. For example, let us say you figure out how to get it to publish to LinkedIn and have a Facebook page, group, and personal profile plus two Twitter accounts you would like to publish to. That would require one zap for LinkedIn, 3 for Facebook, and two for Twitter at a total of six zaps. Each new post you make on Steemit.com would then use 6 of your total 100 free actions giving you a maximum of 15 posts per month shared six times for a total of 90 actions. For $20 a month, wouldn't it be worth it to be able to share 2 or 3 posts per day to all of these social media websites? I currently have 2 shares to Facebook and one to Twitter with potentially setting up a second Twitter integration and maybe getting LinkedIn to work with the goal of publishing 30 to 50 new posts a month on Steemit. I will be on the $20 a month plan at a minimum and then upgrading to use it for email marketing with my Thinkific school as well. Paying for help with automation in my mind is a very worthwhile expense! THANK YOU VERY MUCH FOR READING THIS! I hope it has been helpful for you! Would you please upvote this if you found anything in it useful or think anyone else will be helped by it because your upvote will help more people not only learn how but learn WHY to take the time to setup automation? The more of us that automate our steemit.com posts to Facebook, Twitter, and LinkedIn, the more new users we can expect to see and start following us! If you enjoyed reading this post, will you follow me because this will help me show up in your feed to bring you more posts like this? Nice... looking forward to getting this set up. Like you mentioned, the problem i have isn't so much the time but rather the consistency and if this helps me solve the problem of posting to a channel then i think it's awesome. I always have problems with images on facebook so hopefully it displays correctly. I must be doing something wrong lol. HaiJerry, I found your videos today, Great work. As always great post great information. Thank you Jerry. Jerry has taught me more in months than I learned in several years of college. I love @jerrybanfield enthusiasim and baring his soul, he makes a very strong connection with all his students. With Jerry joining STEEM, that takes all things learning/earning to another level. I often find myself what was college for? and why did I spend so much $$$ for it? You should also be able to set things up to auto post to reddit/r/steemit as well. 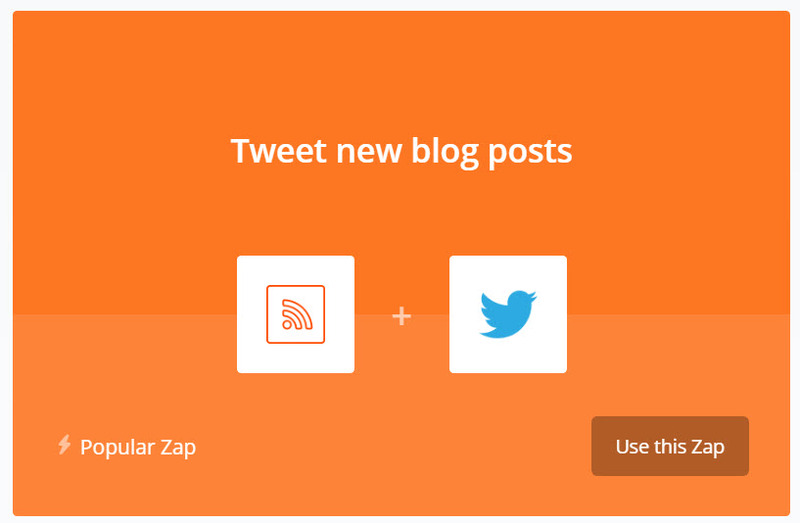 Thank you for suggesting this because I just looked in Zapier and I while I see there is a zap, I am not sure how to get it to bring my posts out there! I didn't even think to search for the zap and appreciate your suggestion! great information. Thank you Jerry. @jerrybanfield you are so fun and kind and giving and sorta nerdy in the best way! You seem like a great guy who I would love to be friends with! Im an artist and a musician, full time, quit my monsanto job and living the broke artist life. Maybe give me a peep and or a follow. But anyway the point of this wasnt to self promote! I really just like your vibe and wanted to encourage you to keep up the great work! :) <3 bless meow! Thank you @quantumbalance I followed! HEY jerry, you share allot of AMAZING knowledge. Although, most of what I learned thus far about technical analysis was from watching Aaron ag. on YOUTUBE. I would like to know if you could give little tips and tricks here and there about how you seem to be the video YODA. Ha, I've never seen anyone manipulate the screen in the manner that you just seem to do VERY well. Keep it up Brorther!!! STEEM on. Helping Others To Help (others) 1 By 1. Great post Jerry! It never occurred to me to use IFTT! Doh! You are the man. I might have to go IFTT crazy soon enough..
Read @ash first since I have IFTTT. Then returned to enjoy your 'show' already linked up in a few places. Will give this a bash when I have a free minute @jerrybanfield - Agree wholeheartedly with you about automation, not enough time to do what you really want to do in a day. Hey @jerrybanfield, whats your opinion on my way of resisting the falling prices? With mining I am skeptical because of the rate at which hashing power seems to dwindle in effectiveness. My friend @aarellanes invested in mining and I will be interested to hear his results! This is really useful information - Should be a mandatory plugin for all crypto Wordpress sites. 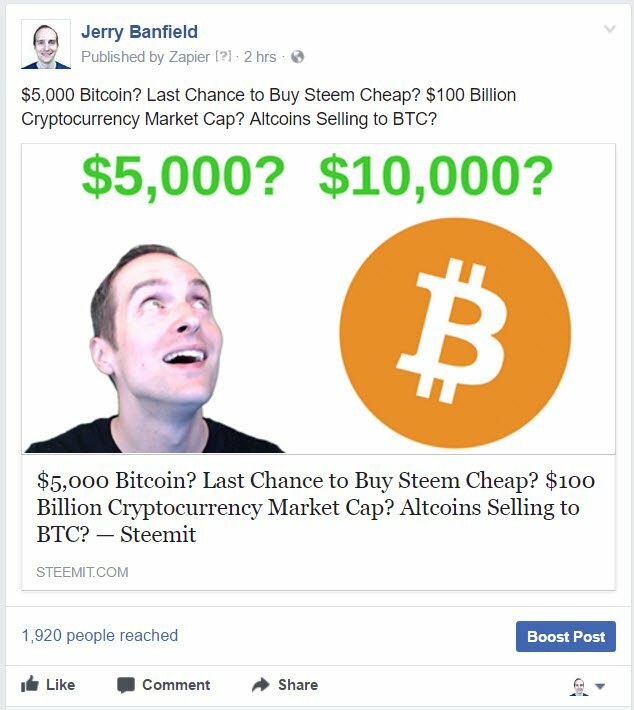 Do you have a suggestion on the best methods of advertising for Steemit platform among friends and in the social media? Great post Jerry - thanks for all your sharing. Steemit is practically the only social media I care to use anymore. This woul be a really helpful tool to direct traffic from my other audiences. Let's let the world know about Steemit! Also, I have been using IFTTT but didn't know about Zapier. Will check it out. Thank you! Once again another great informative post!!!!! The Steemit community appreciates you @jerrybanfield !!!!! 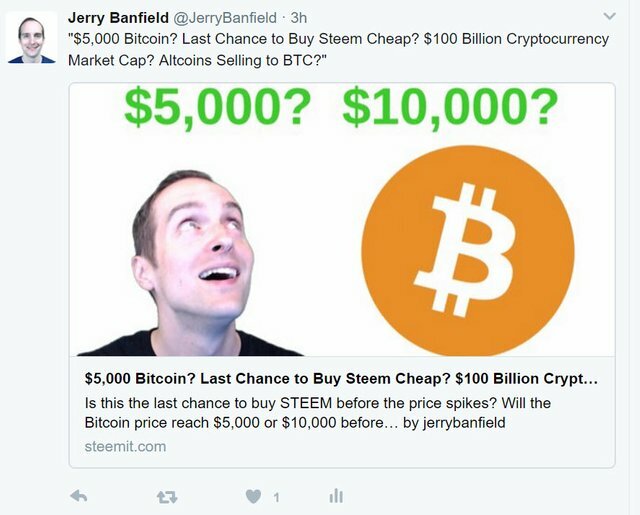 Awesome to see you're on Steemit Jerry! I can't speak for everyone else, but with an app, I'd be available here at least twice the time here. I do agree, typing this reply on my phone the letter input lags for a few seconds, so just unusable and would really put off friends using it on their phones and maybe Steemit altogether! Hopefully this gets resolved soon as a bad first impression can turn people away for a long time. Thank you, Jerry. You have a new fan! Very informative Jerry. Much appreciated!! hey jerry you are everywhere these days...and the fact of the matter is sometimes at the same time..LOL! stay blessed and keep posted. Monsterous blog! That's Sunday sorted! Haha damn man where do you find all of these, this tool will deff come in handy for allot of people! This will save me more than 6 hours a year more like 6 hours a month. Man! Can you advise any site that uses steem content but rearranges it somehow... Steem wall is so linear. I wanted to find something like tweetdeck. Do u know something? Very helpful post. Thanks for sharing. I will set this up for sure, it will save me alot of time from having to cross post every time I write something new. Thanks again Jerry! Thank for getting people to steemit.com....please follow @ britvr and youtube (Britvr). I'm following you now!!! This seems useful to share your blog with your friends and Twitter followers; I don't really post much so I probably won't use it, but I might try it some day if I do start, thanks for sharing! My facebook profile and pages show correctly but my Twitter doesn't show the main picture of the post. It only shows the link of the post. I'm not sure why. I tried many things. If you have any idea let me know. It looks like Twitter is showing now! Sometimes random errors happen where the picture does not show on Facebook or Twitter which I do not understand either! My newest post's picture did not pull correctly today. All the pictures look like they are up on your Twitter profile for me! how do you get it to show the whole post and picture ? Thank you so so so much, I really appreciate this info including the video. Im going to follow your instructions and start doing this to. This is awesome and so are you. Brilliant!! i found you on you tube, looking for a how to use bittrex video. Then i watch a few more and you just cracked me up. Now the big question is what did you do with your blog? Did you shut it down? What happens to all that blog content? I'm curious about shutting my blog down also. Thanks, Jerry. I am going to try it. This can also be done with a cool tool called IFTTT or If This Then That. This was crazy helpfully to me! Thanks man! Lol, but of course..streemian rss is down. Bummer. thank you so much! I am constantly learning & tweaking. I am even thinking of creating my own app. Everyone here on steemit has been very helpful!!! I hate to ask. I know you are a busy man but would you have any idea if the "communities" are coming to steemit? I keep reading that they are bu can not find a definitive date. it´s now more than 10 hours ago since I send 0,001 sbd to steemian to verify my account and it´s still not verified- I´send the 0,001 sbd twice. How long does it usualy take before they verify something?